Why does tapering freak out the bond markets? Since Ben Bernanke announced on May 22nd that the Fed was contemplating tapering the rate of its asset purchases in the near future, market watchers have been obsessing over how near that future is exactly. With a positive payroll report for June, the new consensus seems to be the September meeting for the start of tapering. The mere possibility of reducing the rate of asset purchases from the current $85 billion per month has sparked a paroxysm of selling in the bond markets. The yield on 10-year Treasury soared to 2.73% last week; that’s up from a low of 1.66% at the beginning of May. It seems that interest rates are much more dependent on the flow of assets into the Fed’s balance sheet, rather than its stock. But long-term interest rates are just the sum of short-term interest rates, of which the Fed has considerable control. So why do markets suddenly think ZIRP will end soon than previously thought? In other words, why does the mention of tapering send interest rates skyward? The answer to this question has two, interrelated parts. First, and most important, is the method by which the Fed conducts monetary policy. It is a sclerotic institution that moves slowly and deliberately, regardless of whether it is tightening or loosing policy. A committee is an inherently difficult conduit for decisive action. Ben Bernanke understands this and therefore chooses to build consensus before changing policy, lest his gains backslide at the next meeting. So, for lack of a better term, the Fed makes sequential decisions. That means you should think of quantitative easing as a firewall between the Fed and ZIRP. In the course of a single meeting the Fed will not stop asset purchases and increase its target for the federal funds rate. It will first reduce purchases to zero and then at a subsequent meeting increase the target rate 25 basis points. This is why the flow of purchases is so much more important than the stock of purchases. QE serves as way to allow the Fed to credibly commit to ZIRP for an extended period of time. When viewed this way, it doesn’t even matter if asset purchases have direct effects. Their main purpose is to put space between the Fed and pushing off the zero lower bound. For evidence of this sequential decision making, consider the history of changes in the federal funds rate target. The modal change, when there is one, is 25 basis points. When the Fed feels it needs to send a strong message to the markets, it changes its instrument of choice 50 or 75 bps. That’s it. Since 1990, the year for which this Federal Reserve website begins reporting federal funds rate targets, there has never been a change greater than or equal to 1 pp in a single meeting (at the December meeting in 2008, when the economy was teetering on the edge of the abyss, the FOMC lowered the target by slightly more than 75 bps to reach the ZLB). Though Obama is likely to appoint someone with inclinations toward dovish monetary policy, the exact identity of this person is unknown and financial markets loathe uncertainty. Neil Irwin summed up the state of play thusly: “The people who know aren’t talking, and the people who are talking don’t know.” Smart money seems to be on Janet Yellen, the current Fed vice chairman, succeeding her boss. But this is far from a certain outcome. Obama reportedly had serious discussions with Larry Summers about the position back in 2009 before he reappointed Ben Bernanke. The president is also very fond of his former Treasury secretary, but Geithner seems content making money speechifying in the presence of bankers. There are also dark horses like Stanley Fischer, the former head of the Bank of Israel, and Don Kohn, Yellen’s predecessor as vice chairman, who can never be ruled out completely. 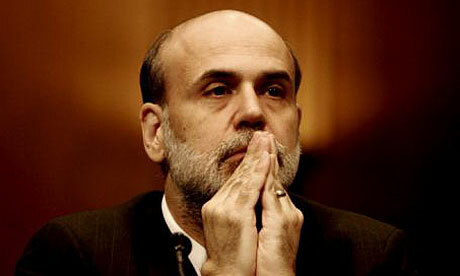 This all adds up to a murky world for post-Bernanke policy. The heuristic the market seems to be relying on is how many barriers lie between the FOMC and interest rate increases. And with every dollar reduction in the rate of quantitative easing, there is one less barrier in place. Bernanke says that asset purchases won’t end completely till the middle of next year, if the recovery continues at its current pace. But there is one problem with that prediction – it won’t be his decision to make. With that in mind, we can’t blame bond traders for fearing that sooner tapering means sooner rate hikes. That’s how the Fed likes to operate. Posted on July 9, 2013 July 9, 2013 1 Comment on Why does tapering freak out the bond markets?